'The sense of mechanical integrity of the Ag-12 Tonearm cable’s 'build is immediately apparent. Furutech Pure Transmission 'technology turns a macro lens on every element of power and 'signal transfer applying optimized engineering solutions to 'well-known problems such as contact resistance, grounding, 'EMI and RFI rejection, and using the best materials and 'processes available. 'RCA to RCA. "The award for best performance and highest build quality at the lowest price goes to the Furutech AG-12," read the full review from Stereophile, here. "A quick turntable upgrade," read the full review from Tone Audio, here. "It's one of the phono cables to beat, and it's affordable to boot." read the full review from Vinyl World, here. 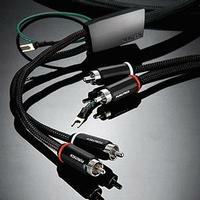 "Furutech's Phono Cables: Master Class and Beyond." The Audio Beat, read the full review, here.